2019 is slated to be a year of elections for the Southeast Asian region. Not only will Indonesia see its first presidential election since 2014, Thailand too has promised to hold an election this year since the military coup of 2014. While Thailand is currently struggling with the prospect of a delayed election, the Philippines is another country facing elections soon. Set for 13 May, the last presidential election the Philippines had was in 2016. It was the May 2016 election that saw Rodrigo Duterte take office the following month as the country’s 16th president. On 9 May 2016, Duterte won the Philippine presidential election with 39 percent of the vote, defeating four other candidates, namely Mar Roxas of the Liberal Party (23.4 percent), Senator Grace Poe (21.6 percent), former vice president Jejomar Binay of the United Nationalist Alliance (12.9 percent), and the late Senator Miriam Defensor Santiago of the People's Reform Party (three percent). During his campaign, Duterte promised to kill tens of thousands of criminals and end crime within six months. As most of the world already knows, this led to the Philippines’ infamous war on drugs and according to the Philippine National Police the death total passed 7,000 in January 2017, after which the police stopped publishing data. The high number of deaths from the drug war also led to global criticism especially from the United Nations (UN) and Duterte, for the most part, has responded with defiance. However, a new phenomenon has also emerged as a result of Duterte’s war on drugs apart from the alarming number of alleged extrajudicial killings. Earlier this week, the New York Times published an article on the dire state of the packed Manila City Jail. “On one recent night at the jail, in Dorm 5, the air was thick and putrid with the sweat of 518 men crowded into a space meant for 170. The inmates were cupped into each other, limbs draped over a neighbour’s waist or knee, feet tucked against someone else’s head, too tightly packed to toss and turn in the sweltering heat,” the article noted. The article also claimed that since Duterte’s antidrug campaign began in 2016, Philippine jails have become increasingly more packed, propelling the overall prison system to the top of the World Prison Brief’s list of the most overcrowded incarceration systems in the world. 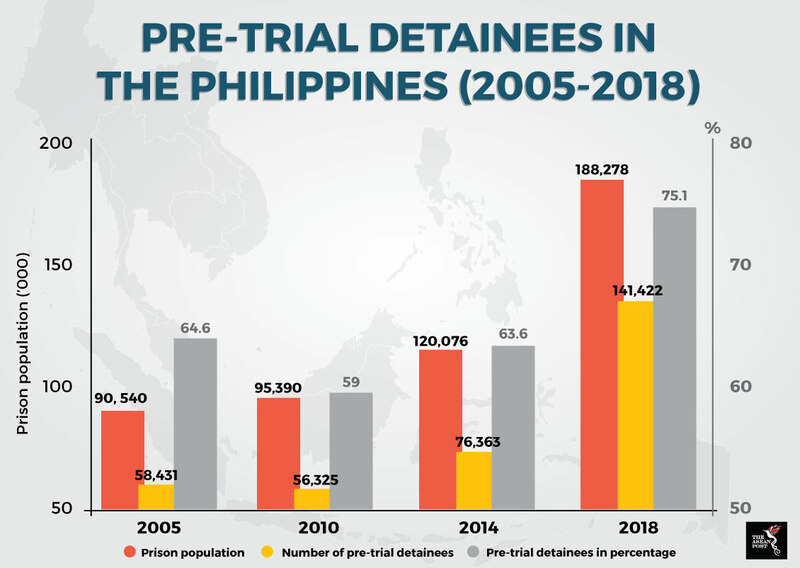 This coincides with a study released on 19 October 2018 titled “Understanding Factors Related to Prolonged Trial of Detained Defendants in the Philippines”. According to the study, on 30 October, 2015, there were 8,915 pre-trial detainees in the six jails under study. The median stay for all these pre-trial detainees is 268 days, suggesting that 50 percent of inmates had already stayed in jail for more than nine months while awaiting trial. The person who conducted the study; assistant professor Raymund Narag at the Department of Criminology and Criminal Justice, Southern Illinois University Carbondale; even suggested that these unusually long periods of pre-trial detention contributed indirectly to the appeal of vigilante justice and Duterte’s war on drugs. “This is what makes the killing of drug addicts and corrupt politicians attractive to the Filipino masses. It resonates squarely with the message of President Rodrigo Duterte of restoring ‘rule of law’ by any means necessary,” he wrote. Statistics from the Birkbeck University of London and the Institute for Criminal Policy Research’s World Prison Brief paints an even gloomier picture of Filipino prisons. According to the brief, as of 2018, the Philippines is home to 933 prisons with a total prison population of 188,278 inmates where 75.1 percent are pre-trial detainees. Narag surmises that the high cost of keeping inmates in prison per year (US$1,375 per inmate) has been a contributing factor to what has edged Filipinos towards favouring vigilante justice. According to Narag, Filipinos think that the delay is a manifest attempt to thwart the goals of justice. This, he says, especially benefits the rich and powerful accused as they can steer the wheels of justice toward their ends. “Eventually, Filipinos lose trust in the justice system and take matters in their own hands,” he said. This phenomenon, in turn, is possibly what gave rise to Duterte’s strong support when he announced his war on drugs campaign. Recently, Simon Shen, an associate professor and director of the Global Studies Programme, Faculty of Social Science, at the Chinese University of Hong Kong, wrote that many ordinary Filipinos appear to favour eliminating drug dealers through summary executions. He said this was because they have lost faith in their country’s judicial system. “Many ordinary people believe that since drug lords have powerful connections, it is almost impossible to bring them to justice through legal procedures,” he wrote. Duterte’s popularity has its ups and downs but ultimately it will be Filipinos who decide come this May. Do they like the way Duterte has at least attempted to clean the country when it was undoubtedly dirty, or is enough, enough?